the drawing board: "You Can't Have It Both Ways." Yesterday, sometime after commenting on a well-written article about the Maxxis calendar debacle on NSMB.com, I received an email notifying me that the comment below had been posted as a response. Unfortunately, I was unable to respond to this epic play of stupidity as the coward who posted it seems to have realized the idiocy of the reply and deleted the question, BUT! Never fear! The Internet lives on forever, bikesales. First, I am NOT the collective conscience for the cycling industry. Y'all motherfuckers are more than welcome to step up and shout your feelings too. If you have something to say, then say it! Christ almighty. It's not my job to be the moral Jiminy cricket for a massive industry that, quite frankly, should have their goddamn act together at this point, and yet here I am, giving you a lesson in human-ing. That, and who are you to tell me what I should be outraged about? It's pretty simple: I won't be angry about everything. I don't have that much room for hate. If I am peeved, you'll know. But don't tell me I should be upset about Emily's choices for herself. That's like... Being crazy mad because someone else across the globe ate Cap'n Crunch this morning and I didn't have any. Ummm. Wut? SECOND, I don't know what magical superpowers you think I have, but if controlling people were one of them, WE WOULDN'T BE HAVING THIS RIDICULOUS CONVERSATION. Because the Maxxis calendar wouldn't exist, you wouldn't have written such a decidedly lame question and I would probably not be trolling the Internet. But I digress. My point is that I cannot control what anyone else does. 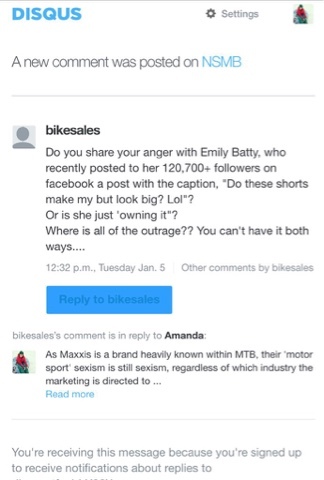 Not Emily Batty, not NSMB.com, not anyone. What someone else does is on them. If a person wants to post something online, I cannot control that. I wouldn't dream of controlling or limiting that. It also happens to be none of my damn business, sir-bikesales-a-lot. What another woman deems worthy of her social media feed is NONE. OF. MY. BUSINESS. Sexual or not, suggestive or not, boring or otherwise, it's not my problem. How another human being wants to brand themselves is just not my issue to deal with. I don't need it and I don't want it. 4: I can and will have it both ways, you troll. Why? Because 'human duality', that's why. Google it. But just because you see my equality-chanting, business-minded professional side as my sole identifying trait doesn't mean that it's all that exists with my sphere of consciousness. In fact, my humanity-loving, female-equality side is one small part of who I am. Another side of me is an eight-year-old who still giggles at farts. And yet one more part is a healthy, sexually open woman. There are thousands of parts of me that combine, conflict and create the complex creature that I am, and I manage to have all of that call at the same time. So YES. Yes, I can 'have it' both ways. I'll 'have it' any damn way I please, thank you very much, and I may even have it all cooked over-easy like my eggs. So thank you for trying to stuff me (and the other incredible people in this industry) into your tiny little preconceived crazy box, but no thanks. Your limits are only yours and your alone. So kindly, you can piss right off, bikesales.